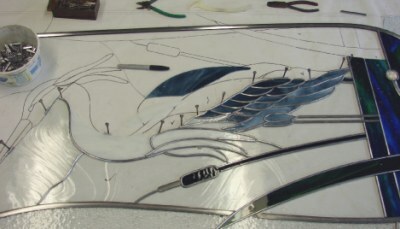 How is a Stained Glass Panel Made? Stained glass is made up of many individual pieces of glass. 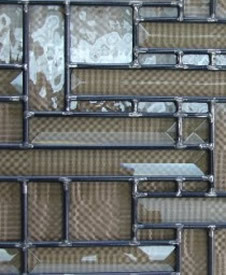 Once a pattern has been decided upon and enlarged, glass is laid on top of the pattern and cut to that size and shape. Once all the pieces have been cut, they are assembled with strips of lead came. Lead came comes in different widths, and with the addition of alloys in the lead, different strengths (stiffness). Relkie Art Glass uses alloy cames for stronger panels. 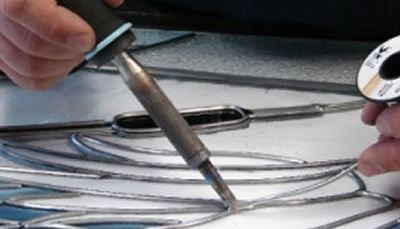 When the panel has been assembled it is ready to be soldered together, then the panel is cleaned of flux and residue. Interior panels are puttied for strength, and then a finish applied to the lead and solder. Stained glass panels to be made into sealed units are now ready for the finish applied to the lead and solder. Black Patina Lead Finish is a chemical transformation which turns lead and the solder joints to a black finish. This creates a nice uniform outline of the glass, and hides the shiny solder joints. Our preferred finish. Silver Lead Finish (available in sealed units only) Lead and solder joints have a uniform silver finish to it. Natural Lead Finish (available in interior panels only, or see Silver Finish for sealed units). Exterior Stained Glass may be installed 3 ways. As a single paned window, as thermal triple paned sealed units, and as a single panel installed over thermal dual panel sealed unit. Having the stained glass panel as the only pane of glass is not recommended for most locations. The panels would be subjected to the weather, which would weaken it over time, and has low insulating properties. Fine in warm climates, as these panels installed in San Diego, not so good in colder climates. Making the stained glass panels into a triple paned sealed unit has many practical applications. By sandwiching the stained glass panels with tempered glass, which is 8 times stronger than normal glass, you have a very structurally sound unit that resists breakage and meets all building and safety codes. The stained glass panel is not ravaged and weaken by the weather, and is very easy to clean! Our triple paned sealed units have a 10 year guarantee against moisture failure. 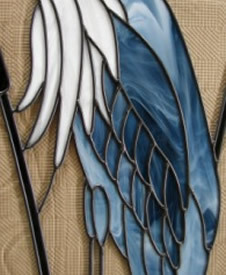 They are made with an aluminum spacer bar that comes in silver or black, depending on the finish of your stained glass panel. 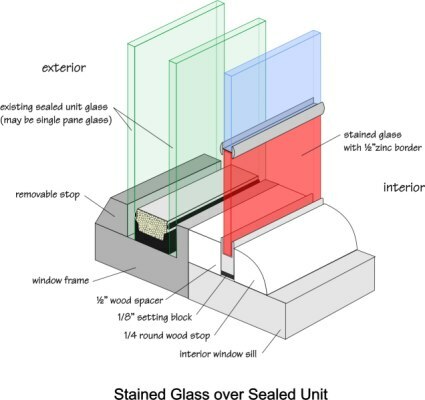 The zinc border of the stained glass panel is mechanical secured to the aluminum spacer bar, spreading the weight of the glass to the perimeter of the sealed unit, which prevents the panel from slipping down in the sealed unit, which happens in many inferior units where “swiggle” seal is used. A primary polyisobutylene seal, used with a secondary compound hermetically seals our units. 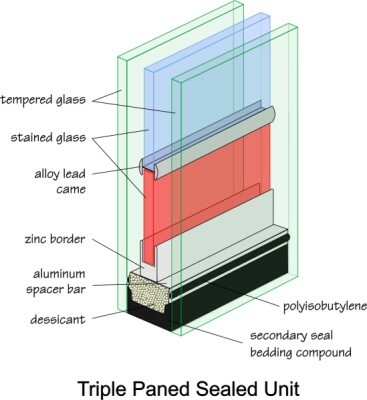 Dessicant is a material placed inside the spacer bar that absorbs moisture and vapors inside the sealed unit. 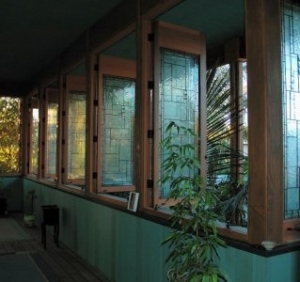 Stained Glass may also be installed on the inside of a window over a dual or triple paned sealed unit. The stained glass panel would need to be spaced away from the window by a wood spacer, and then held in place with a wood stop. Relkie Art Glass can supply you with these pieces to ease your installation. Relkie Art Glass has done a wonderful job on my doors and windows. 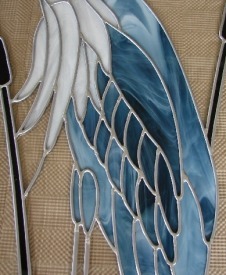 We get lots of comments on the design and beauty of our art glass panels. When the sunlight strikes the art glass, it is fantastic. It has truly added value to our home.